Sea levels have been shifting for thousands of years, but has a half-century of global warming caused irreparable damage to Georgia's barrier islands? The Atlantic coast off Skidaway State Park. Savannah was unofficially established in 1733 when James Oglethorpe and the first group of English settlers arrived to stake their claim on Georgia’s coast. Parts of Wormsloe Plantation, the oldest structure in Savannah, still stand as a testament to those first settlers. Other parts of that settlement have been washed away with the slowly eroding coast. Though Savannah has survived fires, epidemics and hurricanes, it is slowly rising sea levels that now pose the biggest threat to our home. More and more freshwater marshes and maritime forests in Coastal Georgia are being damaged by saltwater. Crawford is matter of fact when he speaks about Georgia's disappearing coast – he’s an outdoorsman first and a biologist second – but as he continues to explain, his distress becomes more evident. Though shifting tides and sea levels over long periods of time, like 18,000 years, are normal, the changes we're currently experiencing are cause for alarm. Georgia’s 100 miles of Atlantic coast have seen a spike in sea levels over the past fifty years, practically doubling the rise indicated in the previous century. The cause? Most scientists, and Crawford agrees, see a direct correlation between these rises and the increased use of fossil fuels and consequent release of carbon emissions. “If you look at any of the scientific data that has been recorded, it shows an exponential rise in CO2 and other greenhouse gasses, which means that the earth is warming,” said Crawford. Though it is difficult to measure a direct correlation between increased greenhouse gases and rising sea levels, examining historic sea level records can help scientists predict the future of sea level changes. Crawford said, “There’s some good records from Fort Pulaski, going back at least to the 1930s, that indicate about a foot a century rise.” According to Georgia Conservancy’s website, analysis of those records predicts that sea level on the Chatham county coast could be a meter higher than current levels by 2110. This reduces dry costal land – habitat – by eight percent. The protected, marshy coast of Ossabaw Island, Georgia, served as an example for the effects of rising sea levels. The first places on the Georgia to feel the affect of rising sea levels are the barrier islands. Eight major islands, or island groups, curve around Georgia’s 100 miles of coast, but they’re slowly disappearing. One of these islands is Ossabaw Island. Accessible only by boat, Ossabaw is the third largest of the barrier islands, and a State of Georgia heritage preserve. John Crawford is a member of the Ossabaw Island Foundation, which works to provide educational programming and fundraising to continue to preserve Ossabaw’s natural habitat. The Ossabaw Island Foundation hosted special day trips to the island in the spring of 2017, to raise money for the restoration of damages inflicted by Hurricane Matthew, which struck the Georgia coast in October, 2016. “We just had the highest recorded tides during Hurricane Matthew, and that is the highest recorded height of water we’ve had in a long time, and that is going to continue,” said Crawford. Ossabaw Island is home to a small tabby house village, history at risk of being lost with the island. Because of its protected nature, Ossabaw is the perfect place to observe the effects of rising sea levels. Crawford explains how islands can serve as microcosms for the habitat of the region, and then breaks it down even further. Alligators, he says, dig deep wells around the sandy edges of islands like Ossabaw. These holes fill up with fresh water from rain and overflow from rivers, providing oasis for freshwater fish, amphibians and vegetation to survive. When freshwater levels are high, these animals venture out and multiply, but in stretches of drought, they retreat to the alligator pits. “Some of those ponds have been inundated with saltwater [as sea levels rise]…so they’re reversing from a freshwater ecosystem to saltwater,” Crawford said. This means that the freshwater plants and animals no longer have a sanctuary, or are killed outright by the saltwater. According to the preservation organization 100 Miles, Savannah's coastline is home to seventy-one high priority animal species and ninety-one high priority plant species; threatened wildlife whose existence is challenged yet again by the rising coastline wiping out the ecosystems they need to survive. 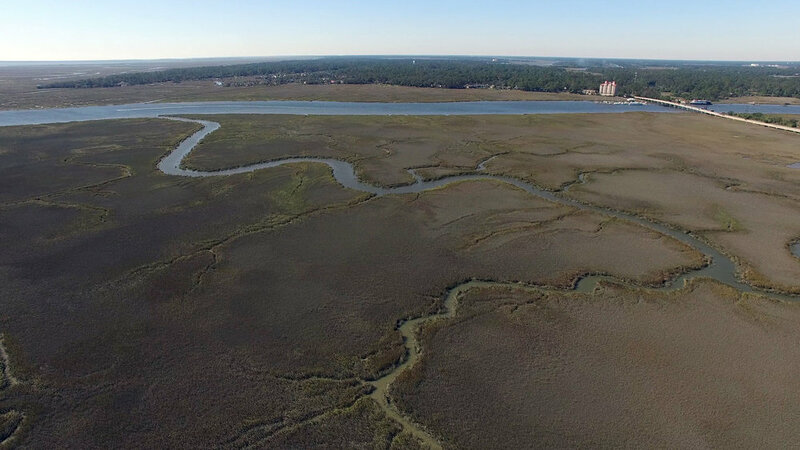 Though the rapid expansion of salt marshes on the barrier islands seems like it has no effect on inland citizens, like those resting safely forty feet above sea level in Savannah, distress in one area of the ecosystem, could upset the balance of local wildlife and, consequently, local farms. The wildlife refuge, for example, resides about twenty miles inland, past Savannah on the Savannah river, but is still suffering from salt water inundation. Because the Coastal Georgia area is currently in a state of drought, no freshwater has been replenished, and saltwater from the rising ocean has been able to work its way up the river. Just like the alligator pond. In order to protect the land that this wildlife needs, and to prevent the dangerous sea levels from reaching the land we live on, coastal Georgia needs to take action, and demand response from the rest of the nation. Though taking steps to reduce our individual carbon footprint can certainly help stymie rising sea-levels, Crawford said it's not enough. "Nothing can be done to change [the sea level]. That’s happening." The massive threat of the Atlantic Ocean looms over Georgia's coast, just like global warming looms over us all. If we are to combat this threat and protect our coast, then we must take equally massive action. Organizations like 100 Miles, Georgia Conservancy and MAREX work to educate the state on the dangers of climate change and rising coastlines, and provide opportunities for community members to give back in small ways. Crawford implored Georgians to take these opportunities to help out, and to take opportunities to visit and appreciate the barrier islands while they can.